This is the second review of It’s all right ma on the site. I didn’t go back and read the first one, I just thought, as I had been asked to, I would try it again and see how differently it came out. I haven’t listened to this masterpiece since writing the first review, and to find the version above of Dylan singing it was yet another revelation. It certainly made me refocus on a song that I bought in 1964 and played and played until I knew the lyrics by heart. And it turns out they are still there in my head 50 years later. Who would have thought it? It is a song of images and rhymes, and in many ways that is the backbone of the masterpiece; the fact that Dylan manages to hold the whole outpouring of words and the unified vision of darkness together in one song is magnificent. But here’s the thing: this is not a protest song, not at all. This is a “this is what it is” song. It is not a call for an uprising, but a response to state of the country as Dylan perceives it. The world which at one moment is “Johnny’s in the basement mixing up the medicine” and which at the next moment says it is all over, everything is broken, that’s just how it is and there is nothing to be done. The light at the end of the tunnel has just gone out; take some more drugs. 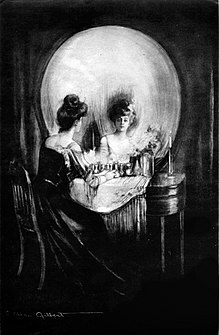 It is the lyrical version of Charles Gilbert’s “All is vanity” – the double picture of the woman looking in the mirror and the skull looking back. Because there is so much rhyme and half rhyme, the song doesn’t need a melody, and so Dylan doesn’t give us one. Instead he takes the title of Elvis’ first ever single “That’s all right, Mama” and gives it a quick twist and suddenly we are out of the light and into the shadows. While “That’s all right” says mama and papa told me the girl is no good, but that’s all right, because I’m leaving mum and dad to be with the girl, so you won’t have to bother with me “hanging round your door” (in three short verses) Dylan goes to the other extreme and seems to say, this is the darkness, and this is all we have. Elvis offers the hope of the teenage lover of being with the girl he wants, getting away from repressive out-of-date out-of-touch parents, and knowing that everything will be all right because the young kids are in love. And at first sight it seems Dylan offers no hope at all. But, that’s not quite it. While “That’s all right” has melody and chords and bounce and charm of 1950s rhythm and blues, “It’s all right ma” with its heavy emphasis on each and every word in the title line, is not so much a drive towards doom but a drive through doom laden streets with the chance to go somewhere quite different. It seems at one level there is no more Elvis sunshine and hope, just the nightmare. It’s life and life only, because there is nothing else, no higher authority, no love, no kindness, no politicians doing what is right, no religious leaders guiding us safely through the torment. Whatever we wanted to be depressed about, at this time here it was. And as I’ve said before, to give a bit of context, I was an only child teenage schoolboy living in a village attending a grammar school in Dorset so I had plenty of time to be depressed. I was also reading Jack Kerouac and 1950s US sci-fi, (which probably wasn’t that good an idea) so I was ready for this. Hypocrisy, war, American culture, politics, trivialisation of everything worth considering… yep, I’d buy into a song that exposed that. Mind you I also had tape recordings of all the Elvis Sun recordings, so I knew That’s All Right Mama as well. I remember puzzling over the juxtaposition of the two titles at the time. I suspect that in debating this song as a pretentious school kid, it wasn’t long before I came across the notion of modernism – that vision that everything new is better and will always get better, and post-modernism, where we know that most of the new is awful, and the tower blocks (housing projects) were the ultimate dehumanisation of mankind. And that was what gave me the insight into what why the last line is “That’s all right mama it’s life and life only”. What we know now about the recording of the song makes it all the more extraordinary – the fact that on one day, January 15, 1965, all four songs that made up side two of the album (Tambourine Man, Gates of Eden, It’s all over now and It’s all right ma) were all recorded, apparently three of the four in single takes. For most people recording four songs of such stature (even though I don’t really like Tambourine Man, I can still recognise its stature) in a lifetime would be enough. Dylan did it in a day. With these songs, indeed with the whole album, Dylan founded his vision, but what did was express it as in the Vanity picture above, telling us that the issue is that of reality. When Dylan asked himself “what is real” he found two answers; “nothing” – and “everything”. You can do your own thing if you want, but to do that meaningfully you first have to realise that the world the mass media tells us we inhabit is not the world, but just a world. Indeed one can make the case for saying this is the fundamental message of Dylan throughout his writing. You can see the world in a million million ways: “don’t follow leaders” means “don’t follow ideologies” – “don’t follow patterns” – “don’t do what your mum and dad said” – which has been something of a vision of Dylan throughout his life, except when he’s ventured into religion. Only then, when he moved over to the need to “serve somebody” – the antithesis of “It’s all right ma”, did he lose the constant thread, but much of the time, when he stops thinking and instead just writes, this is where he is. So the message is not that we can go out and change the world, the message is we don’t have to, because the world is not fixed. The world is how you see it. Do you see the mask of death, or the lady with the mirror? It is this awareness that gives us the sense of alienation which precedes the creation of or discovery of a world in which we are at one with what is around us. For many of us (certainly for me) it can take half a life time to get there. Thus we are never free from the rules of society and the like until we want to be, because the rules of society like everything else, are just what we choose to see. For Dylan I think this was a great release because once you recognise the world is not fixed but simply the cumulation of meanings from inside your head, the images flow far more readily. The opening “Darkness at the break of noon, Shadows even the silver spoon, The handmade blade, the child’s balloon, Eclipses both the sun and moon…” is just about the most powerful opening to any song I have ever heard in my life. It is the end of all things, and that is just the start of the song – but it doesn’t mean that this is the only way to see the world, as the song makes clear. The fall of Nixon, Jimmy Carter quoting “he not busy being born is busy dying,” when accepting the nomination of the Democrats… and many others since all gave a sense that the song spoke of individual events and people, but actually it speaks of the human condition. As we get inside the song so we enter a new world where nothing is sacred, a world of men where everything is broken, the darkness, which was soon to be populated by the freak show as Dylan subsequently introduced all his strange and odd characters that rose up in Tom Thumb’s Blues and other manifestations and finally held an insane party together in the Billion Dollar Bash. And of course none of this has really dated. “Advertising signs they con you into thinking you’re the one,” is far more relevant now than it was then – and it sure was relevant when Dylan wrote it. Of course with such lyrics, such unremitting flowing images, five rhymes in a row, one doesn’t need a melody. Just one chord and a descending bass line ending with the quick chord change (tonic, minor mediant, fourth if you want to know, but I don’t suppose you do). It is the guitar that gives us the descent into hell while the voice stays on the one note, probably the only way the song could ever work. and then the intermission, the round up, the break when the melody finally arrives. Yet between all these pictures of doom, with the stress that “It’s all right ma” we have the hints as to why in the midst of this dark bleakness and chaos, it is all right. That’s really the first clue that we get to what is going on. It is appalling, it is dark, it is chaos, BUT THERE IS A WAY OUT. All you have to do is see the world in your own way, not their way. and yes, it is not that hard. I can do it, you can do it. So how do we go about this transformation? simply because as he has told us over and over here and since, you “don’t follow leaders” you simply see the world as you want to see it then it is your world, then you can be released, then you can be happy. In this way we can survive the nightmare world, because we can pick and choose. And so the conclusion is inevitable. I see the world in a different way – and that ability would horrify the rulers of the world, because independent thought really is the most challenging thing for any person trying to maintain power (not least because independent thought can lead to the notion that we don’t want anyone trying to maintain power). So yes, of course in this world, they’d want to chop Dylan’s head off, but never mind, they can’t read his mind, so it’s ok.
Later, I started to study psychology and although my main study has always been the psychology of perception (which is how I come to write adverts for a living) I also got interested in cognitive psychology and what might be called positive psychology. In this field (and I write here not as one who has specifically studied this area of psychology, but as one who got drawn into it once my studies were concluded) we have William James who postulated that happiness is created not discovered. One theory that struck me was this: we none of us remember exactly what happened in our lives, and some of our memories are just plain wrong. In others we give emphasis to issues as being of great importance, only to find years later that those who shared those issues that have become lodged in our memory can’t recall the event at all. We can be tormented by some terrible mistake or faux pas which no one else remembers. So, the theory goes, if we can select the memories we want, and just focus on the positive memories not the bad ones, and start to retell our life history in a way that we like, then we can create ourselves as happy, contented, enquiring, developing people. It is all there for us, we are not held in position by our pasts, any more than we are controlled by the maniacs who run our governments. The boy Elvis sang about in That’s all right mama was chained in by repressive parents, and so chose what seemed the only solution – to walk away. But actually we have much more choice that that. It’s all right ma, we can choose our own lives simply by changing the way we see the world. It’s life and life only. This entry was posted in Bringing it all Back Home. Bookmark the permalink. Wow Tony, what an amazing article. I was enthralled as you uncovered so interestingly and insightfully the meaning behind the lyrics of this complex song. Your take on things actually lifted my spirits, particularly those observations near the end concerning our memories. I really liked that bit now that I am a bit over the hill! Just great. Thank you. Dearbhla, you are too kind. I got a huge amount out of your article on the site too. about a chord in the song ,that is also in Wake up ,little Suzie. Is this his song for S.Rotolo ,getting even with her,after all the blues?